Are you sure about photography as a business? A while ago, Keith was interviewed by Justin from Breathing Color for one of their podcasts. This article is based on a transcript of that review. Is it still viable to take on photography as a career? Adding new equipment to your arsenal – rent or buy? Keith and Karen are happy to contribute to interviews, Vlogs and podcasts – just give us a call. • All of Keith’s ‘business of photography’ articles are available for free on this site. Making a living doing photography is tough. Many people have a photography hobby, but turning that hobby into a full-time career takes more than a knack for art. It takes business sense, a strategy, and revenue. In this week’s episode, we interview Keith Cooper, a commercial photographer based in Leicester, UK. Keith shares with us his experiences working in commercial photography – from how he approached making it his full-time job, to the tools and tips that help make him a success. Justin: In this episode, we interview Keith Cooper about how to turn a photography hobby into a profitable career. Justin: Hey everyone, and welcome to AskBC. I’m your host, Justin, and today we’re going to be talking to Keith Cooper, from Northlight Images. No doubt if you’ve done a Google search for pretty much anything related to printmaking, you’ve run across Keith’s website and blog. Keith is a commercial photographer, printmaking educator, and all around charitable guy when it comes to helping others get better at making art, so I’m super excited to be able to talk to him today about making a living as a photographer. Keith, thank you so much for joining us, welcome to the show. How’s it going? Keith: Very well, thank you, and thanks for asking. Justin: Yeah, no problem. As I mentioned, we’re going to talk about making a living as a photographer. Pretty prevalent subject, considering most of the people that listen to the show and follow our blog are engaged in photography in one way or another; whether it’s at a professional capacity, hobbyist, or kind of like myself, just as a consumer and a general fan of art. The image capturing technology available today in smartphones and such has pretty much turned everyone into a photographer, a hobbyist photographer at a certain degree, which begs the question, is it still viable to take on photography as a career? I see that there’s certainly still a huge need for trained professional photographers to deliver images at that commercial capacity, but what about photography for the pure sake of art? How do you minimise risk there? What are your thoughts on that? Keith: It’s really tricky, and for most of these things, you need to know if you’ve got a market for it. If you’ve got great pictures, but nobody wants to buy them, then you have a large pile of great pictures, but you’re not making any money from it. If you can find local sales then great, people are more likely to buy local images or images that mean something to them, but in general, it’s about the business, and that’s what a lot of photographers forget. Justin: Right, yeah . When you say local, you mean like the subject of the photography? Like images that are around your space? Keith: Yes! I live in Leicester, in England, the place where they found a king in the car park. I’m some distance away from the sea, so there’s no point in me having great seascapes for sale, because people aren’t interested for them. If I lived at the seaside, if I had a small gallery there, I’d have local pictures, of the local area. That’s what people buy, but people in general just don’t buy much in the way of prints. Justin: Yeah. That makes sense. It’s kind of a balance between what you’re passionate about taking photos of and what makes sense from a marketing perspective then. What was your entry point into photography as a career, and how did you navigate that split between photography as an art and as a commercial service? Keith: I took up photography for a living in 2004. I can date that. That was when I was 44. I’d had a successful career in a number of other businesses, had photography as a bit of a hobby, and was in a position where I could actually look and think, “What do I really want to do?” and I looked at photography. That was where I realised that sure, I might love going around taking landscape photos and producing huge great prints, but there wasn’t much money in it, certainly here in the UK. I looked at what areas of photography I as a photographer was competent for, what areas I didn’t want to do. I looked at a lot of things, and came up with a business plan. It came down to coming up with a business plan that I felt could actually make some money and make a living of. Hence, why I do commercial photography. I don’t do weddings, I don’t take baby photos, pictures of pets. I would lose the will to live if I had to do that. Sorry folks, it’s a skilled area, but it would really bore me to do it. I would have no interest, and if you can’t maintain interest and the business side of it, then stick with the day job. Justin: Yeah, that’s a great point. I think some of these things that you’re talking about is just a huge highlighting, like something that should be a glaring point that people should take from this podcast. It really is to take that approach that you did, and from a more business aspect. People are just kind of like, “Oh, I like taking photos. Let’s jump in, buy website services, and try to sell these things” with almost zero consideration of what will actually sell. “How should I approach this? Do I have business model?” I feel like that almost never crosses people’s minds when it comes to making photography a career. Clearly, you did this and it’s working for you, so I think that’s a great point that you made. What are some of the most common types of images that you’re hired to capture? Keith: In architectural work, it tends to be quite dull, boring buildings, and that’s where the skill comes in, because almost anybody can take great looking photos of iconic buildings. It helps if you’ve got the right kit, with tilt shift lenses and things like that, but almost anyone can take a picture of a great building. When it’s an extension to a house, or a new shed out back, making an interesting photo of that takes a bit of skill. That’s where you have to have nice weather. You have to accept that it’s never going to be a great work of art, and essentially one of the things I’ve found in business is, your job is to produce the photos that the clients want, not the ones you want to take. Just because you don’t fancy taking something, you don’t get a choice when you’re doing it for a living. Justin: That’s gotta be tough, to put your thoughts about the image aside and present what you think will look good, regardless of what you think. That’s got to be a hard decision, something that’s pretty tough to do. Keith: It is. In many ways, that’s one of the skills of being a professional photographer – that you’re there to do a job. You’re there to produce a product, and that product is an image that the client is happy with. You may get to work with them and decide what the artistic line you’re taking is and what lighting they want and nice things like that. However, most of the time, you’ve got an hour to go somewhere and take some nice looking photos of something. The thing is, you know the photos are never going to be produced to any size, they may, at most be produced at 1000 pixels across on a website, and you have to produce the same element of skill to take that photo, as you would for a commission for a large print. Justin: Yeah, that’s tough. Does commercial photography involve a lot of setup and research from your end, or it is more of showing up and figuring it out when you’re on there, winging it and ending up with these shots that are acceptable to the client? What’s the ratio of preparation to winging it? No, of course not, but yes you do sometimes. Preparation can definitely help, and of course it helps you look more competent! Google Maps, Google Earth, Street View, are great tools for some of the commercial properties that I photograph, because they’re already there. I can look at them. I can look at a map, so I know what direction they’re facing so I know that if it’s a South facing elevation, then the sun is going to be shining on it around mid-day. If it’s an East facing elevation, then I need to go in the morning. There’s little bits like that. You may need to actually get permission to go on site. You may need to talk to the building management people, because it may be the architect that’s commissioned you to take the photo, but the building has now been handed over to its owners, so you then have to deal with the owners and get permission from them to go on site, take pictures. That’s something that you need to think about in advance. In terms of really thinking it through, most projects don’t run to that much, other than knowing where you’re going to be. Justin: Yeah, right, that makes sense. I can imagine it varies a little bit. I guess it’s a case by case basis thing, because everywhere is going to be a little different – every job is going to be a little bit different, right? Keith: Yes – that’s what I like. Justin: Do you find it difficult to stay inspired and motivated at a personal level in creating your own art, when your full time job is to create these photos for other people? 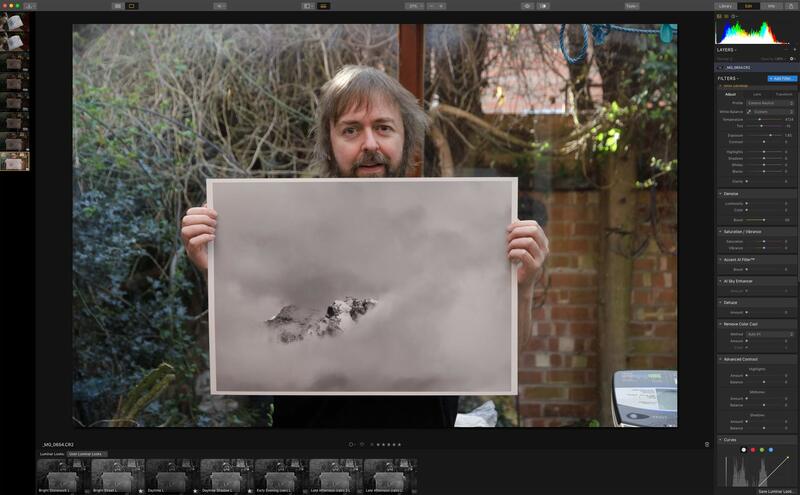 Keith: Well, when I set up Northlight Images, the company that runs as the photography business, one of the original aims of it was to have no more, on average, than two paid jobs a week. The reason for that is that I understood quite well that if I was working five days a week, I should say that if you could get five days of work a week, but if I was working five days a week, my inspiration would go. I know myself well enough to know that if my interest starts to flag in it, you’re not going to get the best results. By setting the business up right from the start, and looking at how it was going to be structured, how it was going to be run, that enabled me to know that I would have enough time to do other things. Justin: Yeah, what a great point. I think that kind of ties back into your initial point of pre-planning this business so well, but balance, what a huge part of your business that is, to be able to balance personal versus your career and keeping that inspiration in both of those avenues is super important. What do you think about working for credit or for exposure as a beginning photographer to get a few gigs under your belt? Keith: It’s something that you should do with great care, because photo credits don’t pay bills. If you’re doing it as a hobby and you just want a few pictures, then that’s fine, but remember that once you’ve charged somebody some minimal sum, or nothing for a job, the next time they want you to take some photographs and you go, “Well okay, our rates are x or y for the kind of work you want”, they won’t see it as anything other than a massive price hike. Once you give discounts to people, and I include doing it for free as a hefty discount, then once you give discounts and they go back, people never remember the discount, they always only see the price rise from last time. You have to be very careful with doing it, and there are a lot of companies that quite deliberately go out of their way to try to get photographers to work for nothing. Justin: Right, and how much exposure are you actually getting ? Very little. Did you take this approach as you started your photography business? Did you ever do for credit or for exposure work? Keith: One or two, they tended to be with a couple of local charities where I was quite happy donating my time as part of work and producing stuff. Doing stuff for them that they could have paid to get done, but it wasn’t really any great trouble. In terms of real work, no, I started out right from the start, I worked out a reasonable pricing structure, and just limited the kind of jobs I would do, to make sure I could do a good job for it and charge people realistic rates. If you do something cheap for somebody, they don’t value it. If you do some work for somebody at a fraction of the price that they would normally be charged, what value do they really attach to it? Probably not a lot. Justin: True. Definitely. I would totally agree. How did you get into photography? As far as training goes, how did you train to be a professional photographer exactly? Keith: Yes, well not something I widely admit, but I don’t have the slightest qualification in photography whatsoever. In fact, if I was hiring somebody to do photography for me, their qualifications would count for very little. I spent several years previously on a number of different careers. I spent some of those years as a university researcher and lecturer, so I have plenty of academic qualifications, and assorted letters I could use after my name if I wanted to, but I don’t. They are in fields totally unrelated to photography. To my mind, my skills that were most useful were the business skills. A lot of photographers won’t like this, but I would say that if you are really great at business, you can learn photography quite easily. Certainly to a competent level. There is this great thing that photographers are somehow different. “Our work speaks for itself.” No, it doesn’t. You need to market it. There are an awful lot of conceits that photographers have and don’t like to admit that, “Well, it’s really not that difficult” to do basic photography. Selling it and making a living from it, that’s the tricky part. Justin: Certainly. Yeah, I couldn’t agree more. How do you approach adding new equipment to your arsenal? Do you do this very often? I imagine it’s pretty tempting to just buy up every new piece of equipment that comes out, so that you can be most prepared for any new jobs that you encounter. Do you ever rent equipment versus buying it? Keith: Personally, I prefer to buy stuff so that I can really learn to use it inside out. Whilst there’s a side of me that would love to have new kit all the time, just to play with, the business side of me requires justification for buying new kit. For example, I had from 2007, I got the Canon 1DS Mark 3, 21 megapixel, full frame DSLR. Great camera, really made a difference. I’d previously been using the 11 megapixel 1DS, so that was quite a hefty jump. When Canon bought out the 1DX a few years later, I skipped it, and the reason I skipped it was one, it was less megapixels, and two, it was aimed at a different type of photographer. It had really great autofocus performance, which is probably not that important when you’re taking pictures of buildings, and it had low level capabilities, so high ISO. Then again, if I’m taking pictures at night, I’ve got the camera on a tripod. So it was a great camera, in many ways a much better camera than what I had, but I looked at what I’d got, and said actually, what I’d got was better. I kept that 1DS 3 until last year, when I got the Canon 5DS, and the jump from 21 megapixels to 50 megapixels in the kind of work I do is really noticeable. I see it, I even see it in the quality of smaller website photos that I give to clients to use. So, yes, there’s a bit of it that I would love to use new kit. I like playing with things as much as anyone. In some ways, that’s one of the reasons I write the reviews, because that gives me a chance to play with new kit, do all the fun bits, although I have to give it back after. Justin: Of course. What a good way to balance that out though. Get your hands on it for a few weeks and mess around with it, and then give it back. Is there a single piece of equipment other than a camera, lens, and a tripod that you think is essential to add to your kit early on as a photographer? Keith: Probably not, actually, because with digital cameras now, I would have said a while ago, “Oh yes, a light meter”, or something like that, but you’ve got a fantastically accurate and flexible light metering system built in to modern cameras. For what I’m doing, for my architectural work, I invariably use a tripod, and a good hefty tripod really makes a difference. For my landscape photography, I almost never use a tripod. In fact, I have a deep dislike of using tripods for landscape work, unless I need it because it’s dark or something like that. I regard landscape photography as a larger scale version of street photography, and there needs to be an immediacy, a certain sort of response to what you’re seeing. To me, using a tripod just slows things down. Some people say it’s good for you, for me, it’s not. As to kit… I would just go for a good bag and a good coat, because getting wet is annoying. Justin: That’s awesome. I want to just tie all of this stuff together that we’ve been talking about. Say that somebody approached you that has a deep, deep passion for taking photographs, wants to start up a business, and you have a couple of sentences to give the most sound advice that you could possibly give them, what would that look like? Keith: It would be, know your market. It doesn’t matter how good you are, if you haven’t got a market, then it’s not a business. That’s the hardest thing for a lot of photographers to realise, that just because lots of friends and relatives love your pictures, it doesn’t mean there are people out there cuing up to buy them. Just because you sell one print, doesn’t mean you’ll be able to sell twenty. Justin: How do you research a market like that? How do you determine what the market is? Is there an easy answer to that? Relatively easy? Keith: Well, look at who uses photographs. Photographs are still widely used. Look at all kinds of businesses that might use the kinds of photographs that you want to take, and this is, I’m not including wedding photographers, where you have a built in market for your photographs. On the commercial side, look who uses those pictures. Where do they get those pictures from? Can you supply those pictures? Can you supply those pictures profitably? Can you persuade people to come back and use you again? In some ways, you need to look at the market before you define your product, because there’s no point in producing certain particular types of pictures and then finding that nobody wants them. Justin: Certainly. That’s the most sound piece of advice I ever heard. If people wanted to find out more about you, Keith, where can they go to do that? I know you have website and a blog, what about social media? Keith: I use them a bit, but not as a major part of our marketing. I’m somebody who doesn’t even generally carry a cell phone with them. Which given my career, before I took up photography, was looking up advanced technologies and how technology changes society and things. It is a bit odd really, but a deliberate choice. Really, I put most of my effort into the website. It has links to Twitter & LI, but the real effort goes into the website, because that’s where I write stuff. I write articles. I make no apologies for them being quite long and comprehensive. They’re there for people to read and hopefully get something out of. Justin: Right, yeah. I know your website is a fantastic resource. Whenever I got into this industry, I actually did a lot of learning from your site and I’d be shocked if the majority of people listening to this podcast haven’t already run across your site. What’s your website address? Keith: It is www.northlight-images.co.uk. That’s it. That’s for both the commercial pages and the articles. The commercial pages are there too, we obviously sell the photography services. I know that the vast majority of visitors actually go there for the articles, or even the Canon rumours that I pop up occasionally on it. Justin: Right. Perfect. Keith, I really appreciate you taking the time to get on the show today and I hope this isn’t the last time. I’m so glad that we finally got you on though. Again, I just really appreciate you taking the time out of your day. Keith: No trouble at all, I really enjoyed it. For more content from Breathing Color, check out the blog. Recent topics include gallery wrapping tips to avoid canvas sagging, a tutorial on how to create custom patterns in Photoshop, and a guide to optimising your computer for image editing.